My kids are at the ages where they’re growing so quickly we’re lucky to get six months out of a piece of clothing — and that’s assuming we bought it too large to begin with. So we’re constantly buying new shirts, pants, shoes and jackets. Among the three kids, their budget isn’t so far off what my husband and I pay for our clothes. And then their old clothes pile up in the closet until we have an opportunity for our semi-annual pilgrimage to Goodwill. Every family with young kids faces these same issues. And that’s what ThredUP.com addresses. 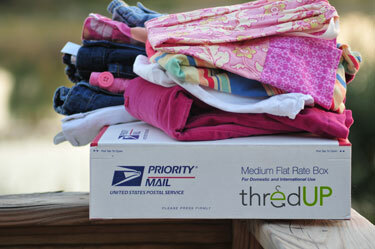 ThredUP provides on online community for parents to swap clothing their children have outgrown. Parents with extra clothing list what they have to offer, and parents with clothing needs can search the site by gender, size and season to find what they’re looking for. ThredUP facilitates the entire process by providing standard medium, flat-rate USPS boxes and prepaid shipping labels for the clothing donors. The recipient merely pays the $10.95 shipping cost plus a $5 fee. ThredUP even arranges pick up from the Postal Service. ThredUp says that a box contains 15 items on average, which would work out to a little over $1 per item — quite a deal. For those concerned about the quality of what they will be getting, donors describe the contents of the box, listing brands and any issues with condition. Items with stains, tears, holes or fading are not permitted. ThredUP members are also rated by other members, so it’s easy to identify reliable donors. If the thought of sharing with complete strangers makes you a little uncomfortable, you can also set up your own swapping group with friends or those donors with whom you’ve had positive experiences with in the past. ThredUp says they have 100,000 members, and thousands of new boxes being listed every day. Browsing the site for my soon-to-be 3-year old son, I found 50 boxes for 3T boys, with everything from pajamas to winter coats to sandals. There were even some age-appropriate toys thrown in. So for parents looking to save money on children’s clothing, ThredUP is a great option. And if you have bags of clothes taking up room in a closet, ThredUP is a convenient way to get them out of the house while helping other parents just like you. I have checked out threadup before and while $5 isn’t bad for a box of clothing some of of really don’t have the extra $5 to spend. You can go to my link to listia and while it is an auction site they start you with 400 credits. you can auction your own items off for more credits and alot of the sellers offer free shipping so you essentially get items for free…. AND it is alot more than just clothing! I have gotten clothing, books, craft items, etc…. FOR FREE!!! I suggest checking it out if you like free or bargain deals! There is that. Or you can skip all the hard work and just go to Goodwill or Once Upon a Child. My wife prefers the former more b/c of their occasional 50% off sales during holidays.